Visit the ARC web site www.arc.org.au for more background information, ideas and Conditions of Entry. Think about the purchasing and lifestyle behaviors of all sections of our community – consumers, retailers, manufacturers and government; what they ‘buy’, how they use it, and how they go about their daily lives. Integrate the ‘BUY RECYCLED FIRST’ message together with all others you see as being important to motivate your community to ‘Make a Difference’. Find interesting ways to depict the behaviors we all need to adopt, ‘sing out’ the slogans you want brought to life. Engage with your community leaders and the media to get even more attention for your messages. Highlight the products whose packaging is not only recyclable, but is made from recycled waste; identifying those products with ARC and ARP logos. For ideas, check out previous years’ winners on the web site. Ensure your entry illustrates the manufacturers’ brands of supermarket products whose packaging is made from Australian recycled waste material (ARC or ARP logos are displayed on the package) as well as those that aren’t. All entries must be in the mail to The Australian Recycled Cartonboard Campaign, PO Box 2210, Fortitude Valley, Qld 4006 by 5pm Friday, 20 September, 2013. You may submit as many entries as you like, but each entry must be accompanied by an official entry form or a photocopy of the form. Together with your Entry, you should submit your entry with clippings from papers, newsletters to show what you have done in your community to protect the environment and promote the ‘buy recycled first’ message. Please do not send any material that needs to be returned to you. All entries must be in the mail to The Australian Recycled Cartonboard Campaign, PO Box 2210, Fortitude Valley, Qld 4006 by 5pm Friday 20 September, 2013. 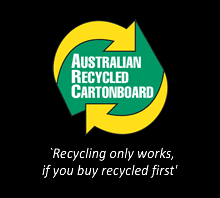 The Office of the Australian Recycled Cartonboard Campaign disclaims all responsibility to return entries. All entries become the property of the Office of the Australian Recycled Cartonboard Campaign and are assumed intended for use in whole or part. As such, copyright or any other rights or entitlements arising from any or all of the entries reside with the Office of the Australian Recycled Cartonboard Campaign. Any use will be at the discretion of the Office of the Australian Recycled Cartonboard Campaign. *In recognition of the enormous contribution made by teachers to their student’s education, the Campaign Office is providing to the Teacher coordinating the Winning Entry, $2,500 toward the costs of attending the professional development course of that teacher’s choice. Each entry must also be accompanied by the Brochure / Entry Form printed by clicking here.